*She had to come back to work for us on breaks! 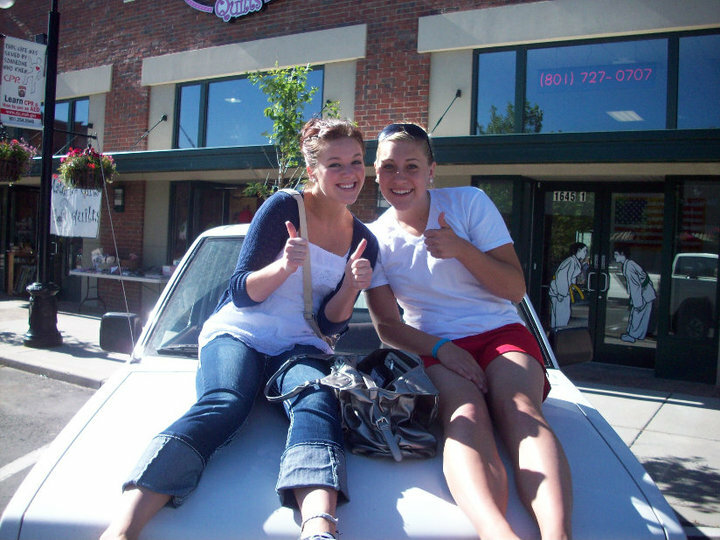 Jaymie and her cute mom Corie! So, every year true to her word she came back and helped us at the shop!! We love her! 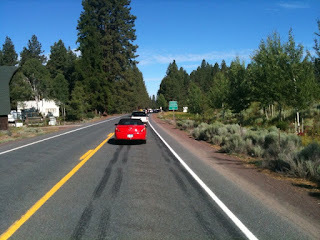 (I am sure she thought we were a bunch of crazy ladies that needed to get out more!) Well, flash forward to 2010 and she has her own pattern company called "Sassypants Patterns" Be sure and check out her blog to see more of her designs (tell her Material Girls sent you.) 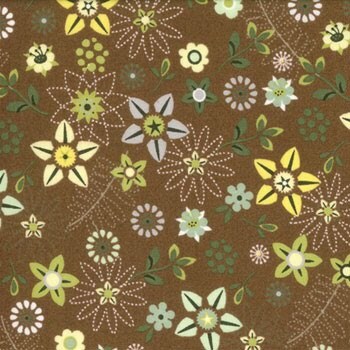 She has designed some of our most popular patterns in the shop!! Her mom Corie is the cutest thing ever and pattern tester extraordinaire! Here are a few of her designs!! If you would like to order her patterns give us a call at the shop!! She will be heading back to school soon and we are going to miss her! We want to let her know we love her and can't wait to see what new designs she comes up with! Wow! Another giveaway again!! We are being featured on My Give Away Today tomorrow (Tuesday) July 27th. Just pop on over to their page and enter to win! 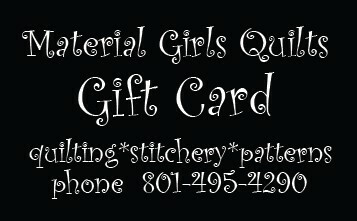 We are giving away 4 ~ $25.00 gift cards. We have a Winner!! Entry number 5 was chosen from "Random Number Generator" but, of course I can't get it to post on here! So if you are Nattyg please contact me because you are the winner!! We also have another giveaway to announce "My Giveaway Today" will be featuring a fantastic giveaway from our shop on Tuesday July 27. So be sure and hop on over there and see what it is all about!! Also we are celebrating Christmas in July this week so be and check out our fun deals this week only! This is a fun line with a twist of mod, funky!! 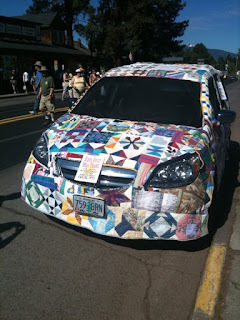 It is ideal for clothing items, quilts, the possibilities are endles!! 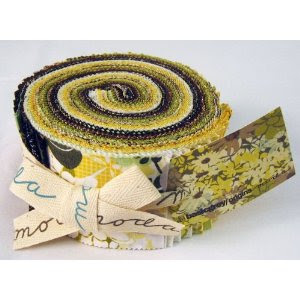 We are giving away one jelly roll for free to anyone who becomes a follower on our blog and our Facebook fan page and leaves a comment and tells us what they would do with it!! So leave comments on our blog and on Facebook. We will announce the winner on Saturday the 24th. Be sure and become a follower as that is how we choose our winners!! Tutorial from "Cluck Cluck Sew"
How cute is this? 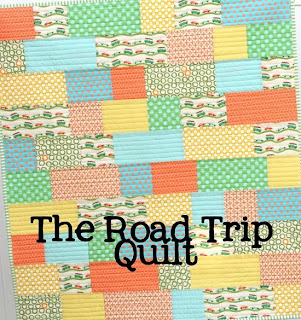 I am always looking for a fast, easy baby quilt, and this fits the bill Perfectly! 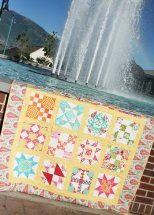 When I came across this on Cluck Cluck Sew blog I knew it was something I had to make! Let me just tell you if you haven't been to her blog, oh my! the girl is talented!! I love her fabric choices but seriously you could make this out of anything and everything. So hop on over to her blog, your gonna love it! We are getting lots of new "Fall" lines and patterns in at the shop...., Awesome by Sandy Gervais, Haunted Mansion by Sanae, and a few other really cute lines, Soliel by Annette Tatum, Luna II by Maywood, oh and the list goes on with just as many new patterns!! To top off all of that, my cute Shelby has decided to really grow up and take another vacation without me....! She is headed off to St Thomas (Virgin Islands) and I am really having a hard time, (she has threatened to bop me if I cry!!) I think she is sick of me telling her about stranger danger and to be careful and yada yada!! I almost made her watch the "Barney" video to get my point across! Anyhoo, lots going on! oh! and be sure and stayed tuned we have some great things to coming up and to announce! Sisters, Oregon! A quilt show! 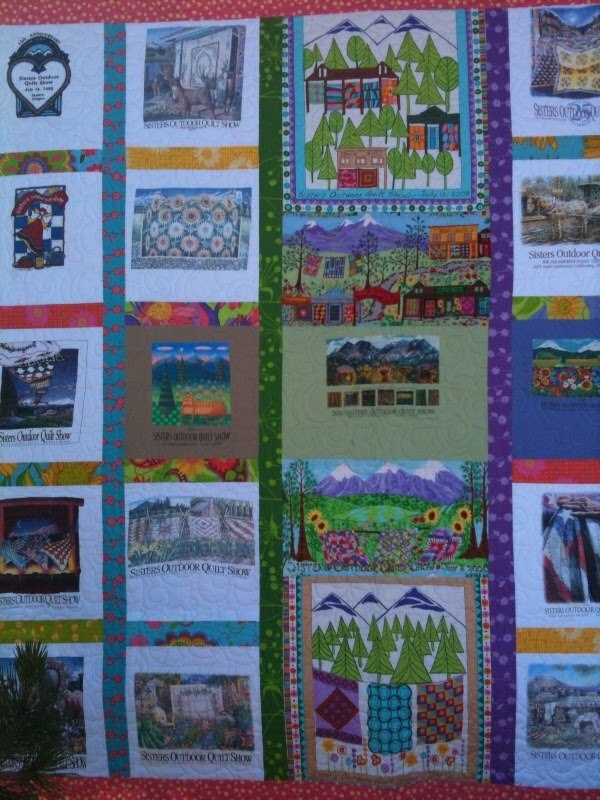 This is a quilt made with all the shirts from past shows. 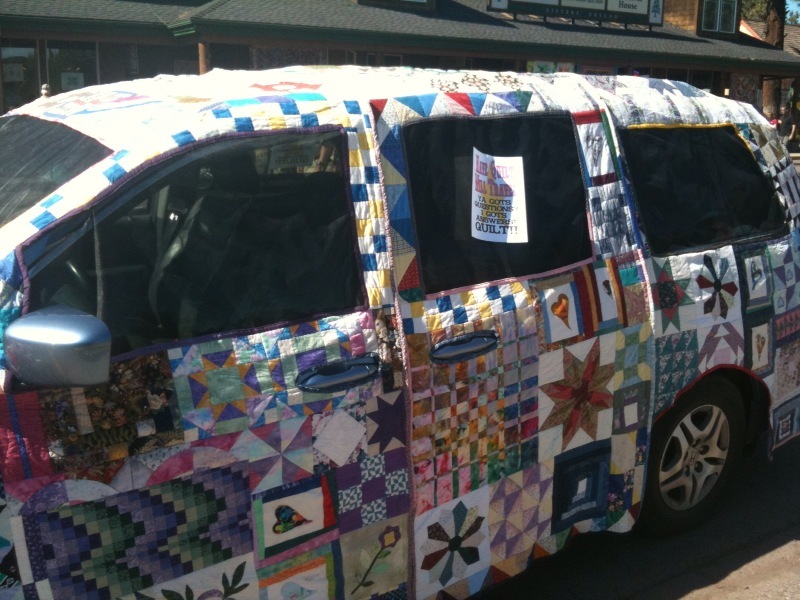 A quilted car cover, yes someone went to a lot of work!! I had to promise Tom I would never take my hobby this far. A wall of amazing quilts! this is a shot of the line of cars behind us! 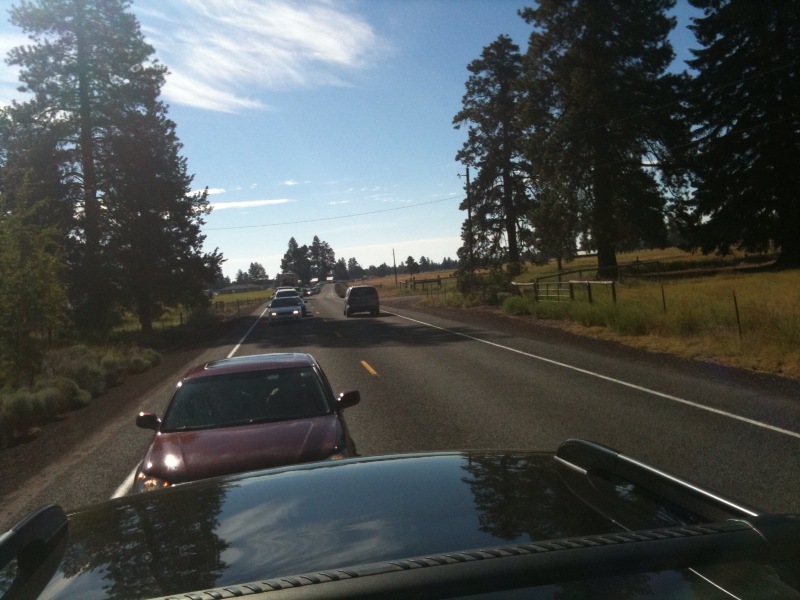 (taken from my sunroof) I am sure the lady in the car behind us thought I was nuts! This is the line in front of us and it was only 8 am. Tom and I got a wild hair this week and decided to head off to Sisters, Oregon!! This is the 35th year of their annual outdoor quilt show. It was amazing!! 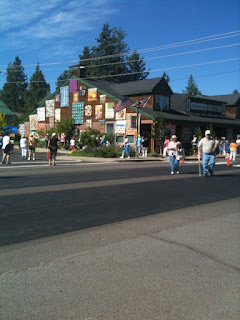 I think Tom and I stopped at every antique store, and quilt shop along the way!! It was so much fun, we ate lots, saw 2 movies, shopped and spent some much needed alone time! Thanks Honey!! (He even put up with my backseat driving) Overall, it was a fantastic weekend. If you ever get the chance to go it is well worth the trip! I plan on going next year, who's in? Do I smell a retreat? This is a video clip of some of the highlights from Channel 2. This is Jamie having a dance off with Debbie Worthen from channel 2. It was so much fun!! This quilt is going up for auction!! I wanted to share pictures of the quilt I am donating to "Live, Laugh, Breathe." It is to help raise money for the "Gwendelyn Strong Foundation". 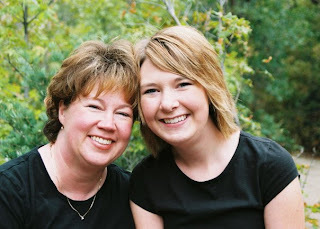 I met this amazing young mom on her blog who lost her beautiful baby girl to a disease called SMARDS. I have never met Kendra (mom) but felt an instant liking for her and her story so touched my heart. You can read more about it on her blog. Her event is July 17 If any of you have donations or would like to help I am sure she would love it! Kendra is picking the quilt up this week and I am so excited to meet her. So, mark your calenders and stop by this awesome event! Happy Zombie's Christmas line arrives! One of our favorite bloggers "happy zombie" Has a brand new Christmas line that is called "Holiday Happy" It is little Christmas gnomes and snowflakes with fun, funky colors. This line is sure to be a Christmas favorite at Material Girls. We have a couple really cute things being made out of it as we speak. I am giddy just looking at it! That Monica, she sure is talented, (I haven't met her yet but she is right at the top of my list next to Donny of course!) So, come check it out! *I only posted a few pictures. We have the entire line! !